Keep your pet on a leash while they run and frolic outside. The innovative tie out mounts in the ground and rotates 360 degrees, to ensure your pup has the perfect play area outdoors. 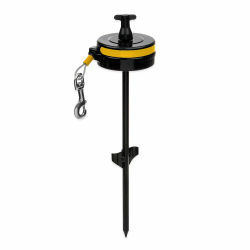 Revolutionary patented design neatly stows the cable in a retractable reel, keeping the cable neat and safe.